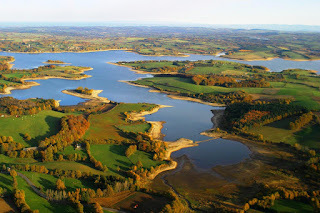 The Domaine des Gerris is a new fishery just below Clermont-Ferrand in central France. Since the summer of 2016 you can fish for carp at this former gravel pit. Covering an area of 6 hectares Domaine des Gerris only accommodate up to four anglers/spots, so the angler has all the space in a beautiful natural setting. The Domaine des Gerris is part of a number of former gravel pits just near the city Clermont-Ferrand (see the map at the center of the map). Nearby is the well known Puy-de-Dôme , part of the French Massif Central mountain range. Domaine des Gerris is highly regarded in France because of the careful owner who is a former fish farmer, or as the French say so beautiful, pisciculteur. The owner is very protective and knows how to treat carp the right way. Of course he expects the same from his fishing guests. Despite the 6 hectares, there are only four fishing spots on Domaine des Gerris in order to reduce the angling pressure and to guarantee a quiet holiday for the carp anglers. The water has a depth that varies from two to five meters. Before its opening to carp anglers the lake was thoroughly cleaned in which the tree stumps and many hurdles under water were removed. Also interesting is the natural food which is sufficiently available (nearby is a large river). The carp on the lake are impressive, which of course is not surprising given the background of the owner. The lake contains at least 40 carp with a weight of over 15 kg. The original lake containted about 150 mostly mirror carp. In addition, just before last year's opening twelve beautiful specimens of between 13 and 17 kilos were added to the Domaine des Gerris that come from a specific region of France known for its beautiful and big carp. The biggest carp currently is a mirror of more than 30 kg, with a typical two-color pattern (see picture at the top left). The fishery also offers the opportunity to fish for trout and contains several large sturgeon with some fish weighing more than 60 kg. As stated above, the lake has four designated fishing spots, which are far apart. For each spot two anglers are allowed, each with a maximum of three rods. Interestingly enough catches on Domaine des Gerris remain good all year because of the favorable climate. The fishery is also open all year, or from 1 January / 31 December. Carp Anglers can book both short and long sessions, starting at 10:00 every morning with a 9 am finish the next day. The short sessions can be booked for 24, 48 and 72 hours, respectively, and cost € 70, € € 130 and 180. That includes 3 kg of pellets per site per day, provided by the owner. Anglers can only use the pellets provided by the fishery. The long sessions last 4 to 7 days, four days fishing costs € 220 and € 350 for seven days. Again a daily three kilos of pellets are included with the fishing spot. The prices are per spot, so if you come with two fishermen you pay 35 euros each for a 24 hour session. Each week one spot is completely blocked the short sessions, which have to be booked well in advance. Furthermore, no pets or visitors are allowed. Fishermen need to use the toilet facilities on site. Reservations can be made through the French owner who can be reached via email and phone. If you want to book a carp fishing holiday, you will have to pay half of the amount in advance. The other half follows on the spot in France upon arrival. On the website of Domaine des Gerris you will find all contact information (in French) and are also detailed regulations again described.